When I lived in LA, I always avoided the 405 like the plague. And while I can’t really blame the road for this, a bus near Bellevue, Washington burst into flames on the 405 this morning, near the I-90 interchange. I still sort of blame the 405. Happily, no one was injured, but the driver and all passengers no doubt had a pretty crappy morning as they escaped the burning bus before sunrise, cowering on the side of the busy highway while they watched the bus burn. That’s a pretty crappy way to start a day. Washington State Patrol suggests the fire may have started near the rear tire. Since most city buses like this are rear-engined, that seems possible. The scale of the fire could suggest some sort of fuel leak, but nothing is known for sure right now. 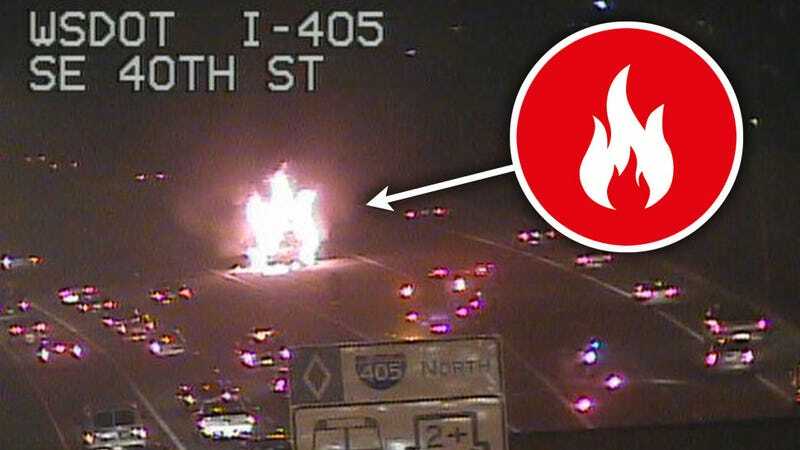 Washington DOT webcams show the flames, which, at least in this one photo, are formed into an almost-perfect three-flame shape that looks surprisingly like the standard ‘fire’ warning icon. The ramp from the northbound 405 to I-90W is currently blocked, but traffic is being re-routed, and, will likely be cleared soon.